Download this application to get remote desktop support for your Lambert Instruments products. A brief overview of all of our products: High-speed camera's, image intensifier camera attachments and fluorescence lifetime imaging sytems. The HiCAM is a gated intensified high-speed camera. 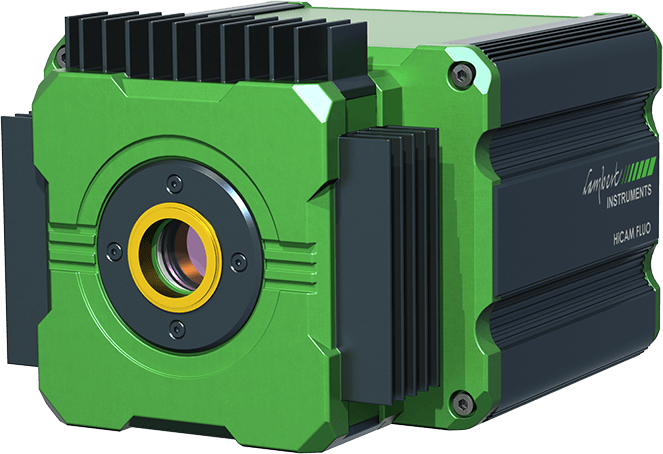 It has an integrated fiber-optically coupled image intensifier, which offers a unique combination of high speed and sensitivity down to single-photon level. The HiCAM Fluo is a high-speed camera for fluorescence applications. It records high resolution images at a framerate of 540 fps in the most challenging lighting conditions thanks to its cooled image intensifier. The TRiCATT is a compact lens-coupled image intensifier for scientific and industrial applications. The TRiCATT is ideal for experiments that require low-light level imaging or ultra-short exposures through fast gating. A next-generation fluorescence lifetime imaging microscopy (FLIM) camera that simplifies FLIM for researchers and imaging centers by combining excellent light sensitivity with easy image acquisition and data analysis. The TRiCAM is a compact intensified CCD camera for scientific and industrial applications that require low-light level imaging or ultra-short exposures through fast gating. It is capable of both frequency-domain and time-domain FLIM measurements.